With six cans of wild salmon in the cupboard and nary a flake of crab, I had an idea. Perhaps I could replace the crab with salmon in my favorite crab cake recipe and make salmon cakes instead. With each bite, we wondered why I hadn’t thought of this before. As it often happens, not even a week later, I came across an unusual recipe for baked crab cakes using cooked quinoa instead of bread crumbs. 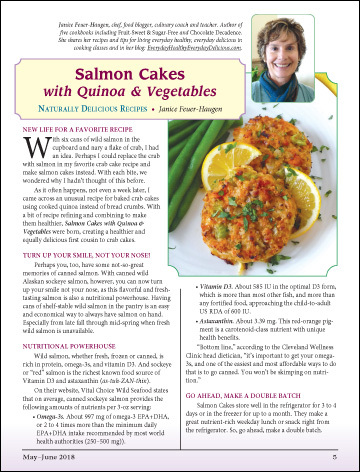 With a bit of recipe refining and combining to make them healthier, Salmon Cakes with Quinoa & Vegetables were born, creating a healthier and equally delicious first cousin to crab cakes.